Congrats to Cast & Crew of In The Heights! 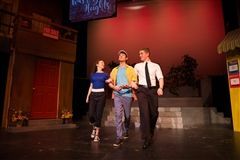 Congratulations to the cast, crew and orchestra of CDS’ incredible production of Lin-Manuel Miranda’s In the Heights! The level of commitment and professionalism brought to the piece was nothing short of sensational. Three packed houses were hooked from the opening moments to the final bows, during which they rose to their feet to give the cast a standing ovation. Not to be forgotten are the wonderful partnerships and friendships that were formed with our local Hispanic community through our Production Partners, Hola! Magazine, Dukát Studios, Fuerza Latina, Miami Beach Grill as well as Silvia Mendez at Radio Voces Latinas, Natalia Lopez Sosa at the Mexican Consulate, Nina Donayre the Barrie Latin Resource Center and our friends at the Hispanic Federation in New York City. A special thank you to our Saturday gala matinee audience whose ticket proceeds along with other show-related initiatives will be going to the Hispanic Federation to support their Unidos Campaign for Puerto Rican Hurricane Relief and their Immigrants: We Get the Job Done Coalition. After March Break, we will be announcing the total of our charity efforts. Finally, we hope that this production has shone a light of understanding and empathy upon the immigrant community, both in our own CDS community and around the world, and has inspired many to continue to pray for and actively participate in the recovery effort in Puerto Rico. Bravo once again to the cast and crew of In the Heights! You were nothing short of sensational. You left memories in the hearts and minds of hundreds of theatre goers that will never fade. Click through the photo gallery below to experience the show again, or for the first time.